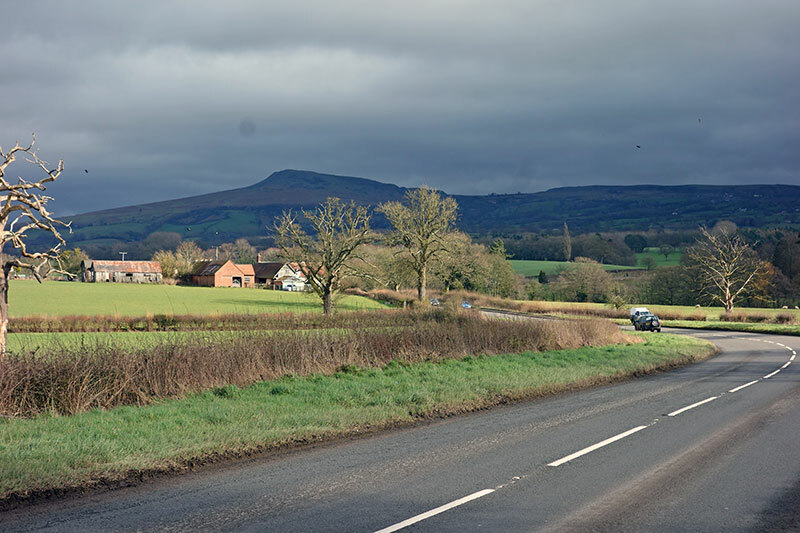 Clee Hill is the highest A road in Shropshire. A long climb, offering (weather permitted) great views of the surrounding Shropshire countryside and beyond. 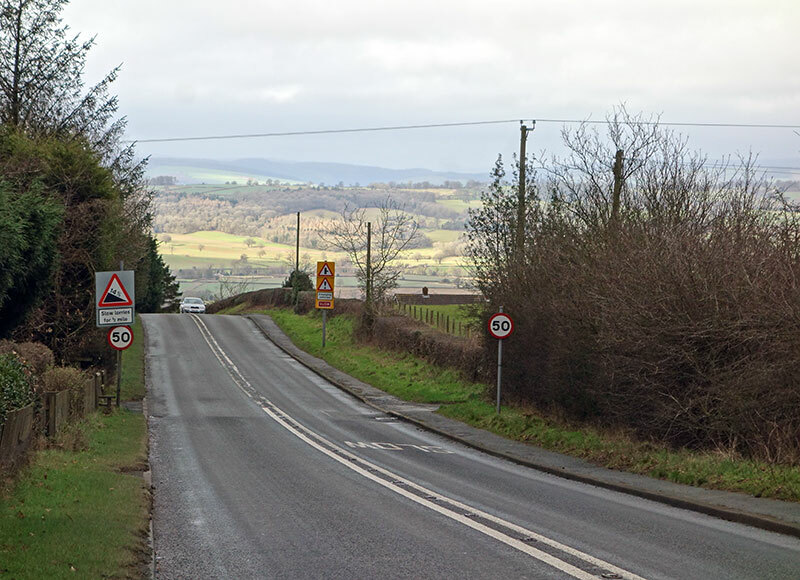 If you take a left turn off the main road, you can also go all the way to Clee Hill summit proper which, at over 500m, makes a pretty decent climb of nearly 4 miles, averaging 5%. In fact, the quiet single track road heading towards a golf ball on the summit, reminded me somewhat of Great Dun Fell. The climb is quite similar to Great Dun Fell – just half the distance and half the average gradient. I was staying in Bromyard for the weekend, so I looked at surrounding maps for the highest point to aim for. Clee Hill stands out, though there is quite a choice of hills around this part. I recognised some of the surrounding roads from previous time trials starting in Great Whitley. I have been doing quite a big block of endurance training, not really doing too many hills, so it was nice to do a few hills for a change. Still a long way from hill climb season though. 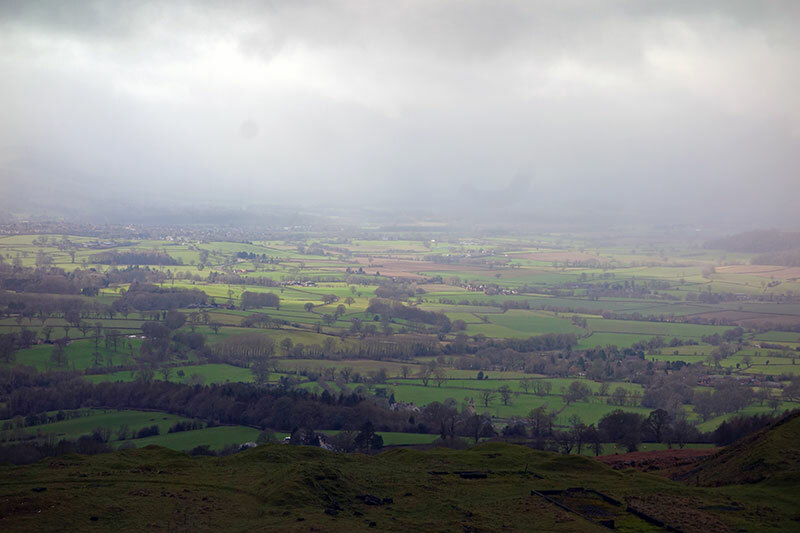 On a very clear day, from Clee Hill, you are supposed to be able to see Snowdonia, the Cotswolds, the Brecon Becons, the Black Mountains and even the Peak District. Today, was not such a time. Saturday was grey and misty. A rear puncture (or loss of air) from a tubeless tyre meant lots of faffing around. I’m afraid to say tubeless technology hasn’t really worked for me, I’ve had a few bad experiences in past few months. When it goes wrong, it’s much hard to put a spare inner tube in. In fact, I did a bit of u-turn and mended the slow puncture out of the rain. 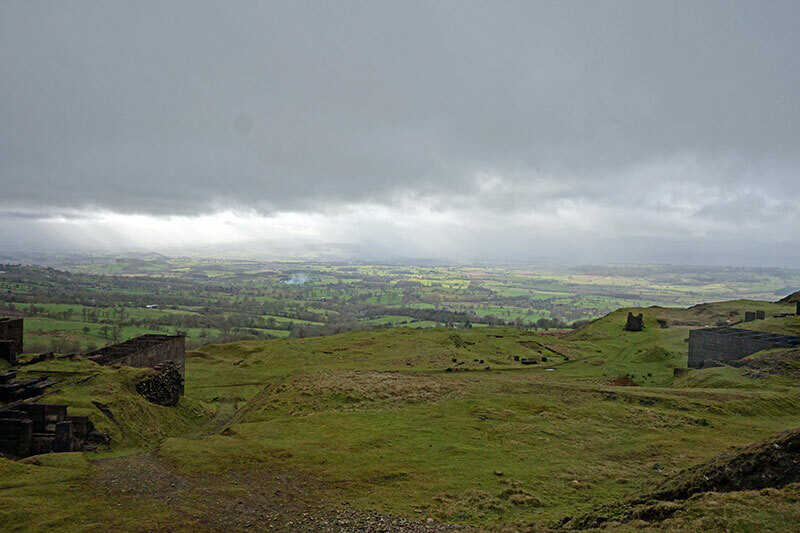 By the time I got to Clee Hill, it was permanently drizzling, with a grey mist rolling off the hills. I vaguely remember Clee Hill from a time trial I did several years ago (it was actually Speedwell CC 36 mile Mountain Time trial in 2010 . It was a great course, but the time trial is sadly no longer promoted, I think numbers weren’t so great for a time trial which finished just after an ascent of Clee Hill. The climb starts off fairly shallow, then half way up there is a steep section, which says 14% according to a road sign. It then reduces in gradient through the village before finishing a bit further on. It’s a long drag, though fortunately, I had a tailwind up the climb.. 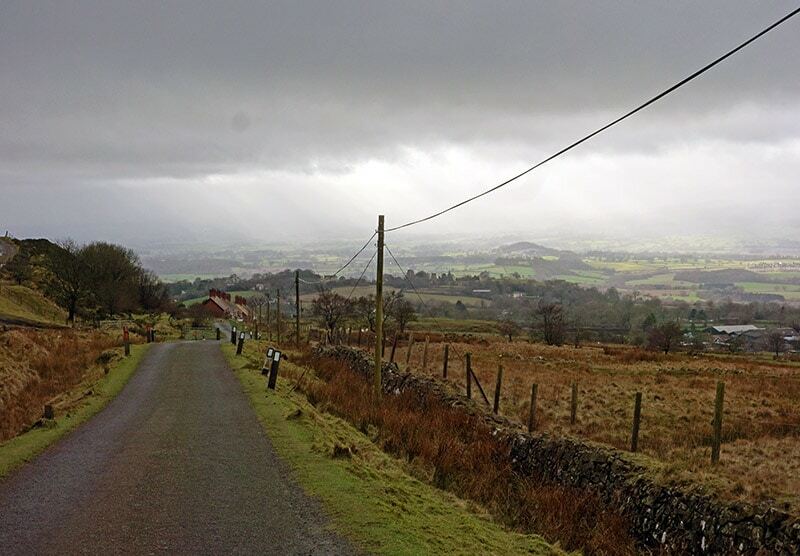 If you turn left, 75% of the way up the climb, you can go on a single track road to the Clee hill summit proper. There are a few dead end left turns, but this one is marked Titterstone and Clee Hill summit. You pass a mixture of disused mining buildings and wild looking moors. On Sunday, there was a small break in the clouds causing some of the countryside below to be covered in light, whilst the rest was covered in clouds. Various ways to the top of Clee Hill. There are various ways to the top of Clee Hill. You can come south from Tenbury. On Sunday I went via Caynham and Knobury. You can also climb East to West from Cleobury Mortimer and also from the Cleobury North to south. I know those roads well, mainly from riding the Speedwell BC time trial. It was one of my cycling highlights of the year and is greatly missed. I could never understand why it attracted so few entries given that the Beacon Little Mountain TT – similar distance, similar type of course, same locality – normally gets well over 100 entries. Yes, I only rode once, but it was a great course. Did you get a chance to ride The Burway in Church Stretton which is not too far away. Nationals course for 1989, it’s a hard climb. Shropshire is a great place for cycling. unfortunately not, will have to come back. 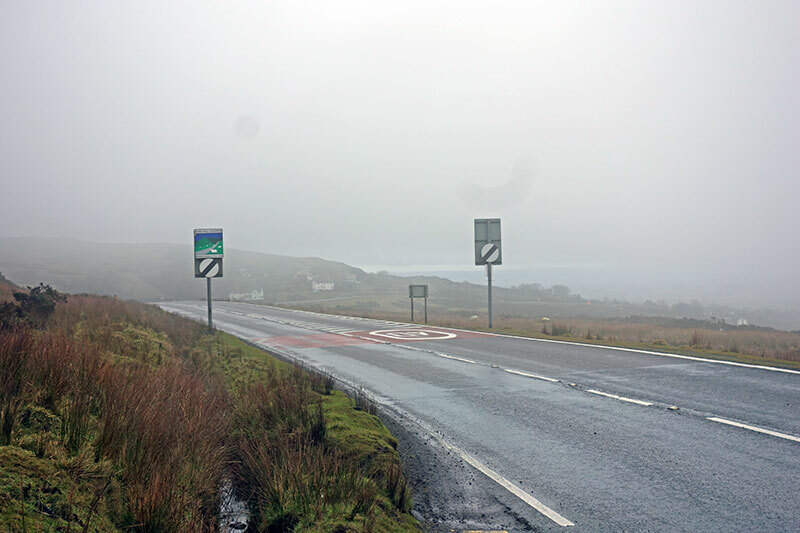 I done that climb back in September whilst doing LEJOG, came across it by chance so detoured up it, as you say a hard climb and a very rewarding view! Went up Clee Hill from Caynham and Knobury with 80 odd miles and 2000+m in my legs last year. Hard work that reminded me of back home in West Yorkshire. Cracking view from the top and well worth it. I also hit 80+kph on the main road back towards Cleobury, over a dodgy road surface it was enough. I too only rode the Speedwell BC 36 once in 2012, the last time it was held. What a terrific course! 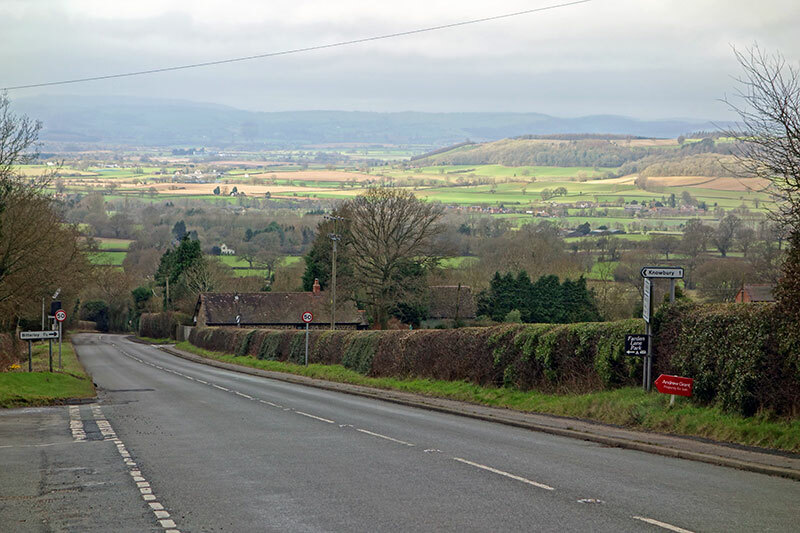 A saw-tooth profile towards Bridgnorth sees you going from top gear to bottom then back, followed by a steady ascent and then descent towards Ludlow before you are confronted by Angel Bank and the relief of the final descent towards Cleobury Mortimer. I took am saddened that it attracted so few entries in recent years. Yes thanks Tejvan , I got the Strava notification you had taken my KOM . Just as well it’s still winter and you aren’t on top form. Rare to visit Clee with out the rain but amazing views on a good day. Have a great season. Just wait for wind in right direction, and you can get it back! Inspired by this blog, I did this climb in the direction you wrote about yesterday. Didn’t time it or anything but thought it quite a pleasant push, well within my capabilities (I’m not that good a rider and I ride an old bike), and the ride overlooking the moor on the descent heading east was spectacular. It’s sort of in two parts, as it descends a fair bit after the 14% section in Knowbury before going up a long straight to Cleehill village. I think I took a different route up, actually. Idiot.